These days it seems to be almost impossible to hold an event without using some sort of AV or IT equipment. Yet there is an expectation that the right kit will be in the right place at the right time, often without anybody expressly stating what is required! CABS helps all involved to get this right, reducing the scope for embarrassing and stressful mistakes. Firstly, CABS expects each booking request to be accompanied with a definition of the type of booking taking place. Where the booking type naturally involves AV or IT equipment, this is all specified and defined behind the scenes so that they are automatically added at the time of making the booking. This also includes any required setup and knock down time allowances to make sure everything is set up and working as expected well ahead of time. Obviously, it would be silly to have a system which allowed finite resources to be infinitely booked, so CABS enables resources to be individually booked and managed or for identical resources to be administered as a pool of limited size, e.g. 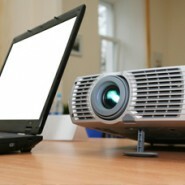 7 Portable LCD Projectors. The requirement for the resource is then tagged against the booking request and the specific person or department responsible is notified by email, on-screen alert (with built in confirmation feedback), a dynamic on-screen diary, or an on-screen or printed report. These resources can be permanently or temporarily decommissioned or pool sizes increased/decreased to reflect changes in availability. If there are rooms that are incompatible with some pieces of equipment, the equipment’s availability can also be limited to bookings for rooms with which they are compatible. Equipment can be set to include associated human resources, e.g. an AV Technician. Reports can be run to derive service requirements or to track down users who may be responsible for any loss or damage. If your organisation operates a recharge policy, CABS will also ensure that the right people get billed for the equipment that they have booked and/or used. CABS offers many more features and benefits in relation to AV & IT Equipment; if you’d like to know more, just get in touch and talk to us about what you’re trying to achieve.